Using technology in the classroom doesn’t have to be an all-or-nothing adventure. We need to pay attention to its impact on student learning, and teachers should be intentional on how and when it’s used in the classroom. Sometimes, technology shouldn't be used. 1. When it decreases the personal relationship between teacher and student. If a student just answers questions or completes work that is posted online without a discussion between the learner and the adult who is trained in the art of teaching, an opportunity for stretched learning and thinking is missed. 2. When it’s being used just to be able to say that it’s being used. Sometimes, a tried and true method works without technology. 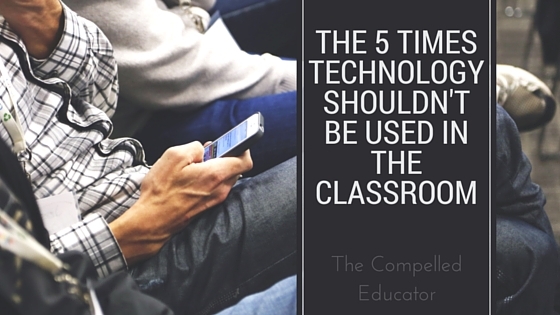 If using the technology doesn’t promote deeper learning, reconsider the use of it. If it’s only being used at the substitution level on the SAMR model, it probably falls into this category. 3. When it makes the learning too easy. Whoa! Don’t we want learning to be easy for our students? Well, deep learning takes work. When technology is implemented incorrectly, it can undermine deep learning. If students can “google” an answer or solve a problem by looking it up on the Internet, students miss out on the opportunity to struggle with learning and perhaps even miss out on the chance to make a mistake then learn from it. 4. When it gets in the way of real communication. 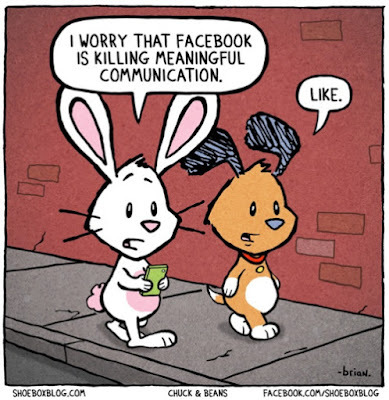 With the “like” buttons nowadays, students can read meaning into it that may or may not be there. Also, it prevents someone from using words to express how they are feeling. If the technology is promoting real communication (think shy student who doesn’t answer in class but opens up in an online forum), then use it. But if it gets in the way of communication, it’s time to stop using it or reconfigure how it’s being used. 5. 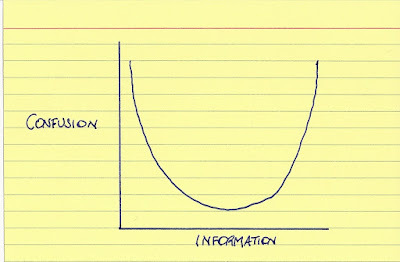 If it contributes to information overload. 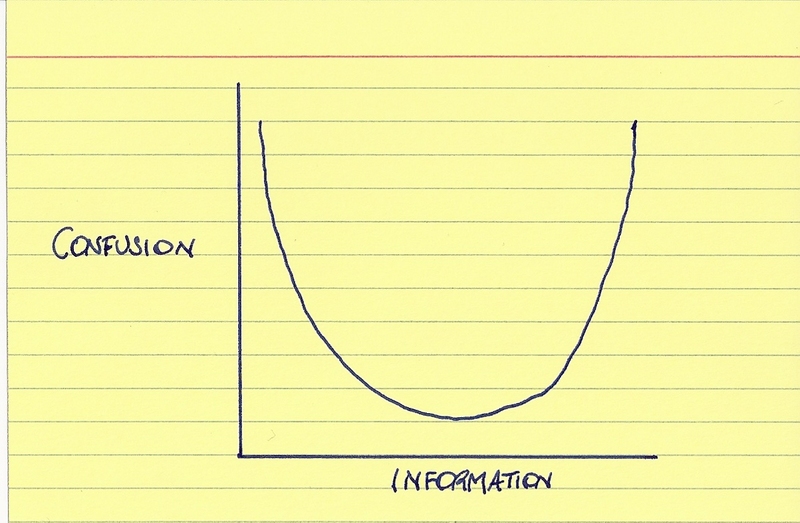 It’s true that all of us are faced with more information coming at us at a faster rate than ever before. A skill students need to learn is how to filter and manage the information. If technology in the classroom is contributing to this, it’s a t the detriment of learning. Just because a student can be exposed to more information in a shorter amount of time by the use of technology, it doesn’t mean that it can be learned at a faster rate. I have another tip to share: "When Tech Can't Replace the Real Thing"
One fall morning, I entered in an elementary classroom. The teacher had projected a leaf on a SmartBoard to explain to students the parts of a leaf. I couldn't help but look out the windows and see the brightly colored leaves piled in the school yard. I tried to "use the force" to get her to stop and take the students outside to physically touch and see the parts of the leaves for themselves! Totally agree and the funny thing is that sometimes you get in trouble doing these things. When I was working in a preschool, I used to teach a poem about trees and how we must love nature. Once we went to the garden and I asked the children to touch and even hug the trees then I was in trouble. Now that IS funny, Eniko! I can't imagine getting upset with someone who wanted their students to experience nature with their senses. Experiences like that teach us more than the lesson we are trying to share with our students. Thanks for adding to the conversation! GREAT point, Neil! We must remember to allow students to learn to use all of their senses, which can't be duplicated with technology. Thanks for your comment and adding to the list! I agree, Jon. Our priority HAS to be to build positive relationships first. I'm glad you enjoyed the article, an I appreciate your leaving a comment. Spot on! As an elementary literacy coach I struggle to see the screen reading a book aloud to a group of first graders. Reading aloud a great book with your students and sharing that experience is irreplaceable. Thanks for posting! Thanks for leaving a comment, Jana! The human experience and connection can't be overrated or taken for granted. I also think that modeling the experience will leave a lasting impression on young students. Thanks for stopping by! Thanks for your post! I love these all, but I would have to say that I especially like #2 and while I KNOW this point, I need to constantly remind myself...it is okay to NOT use technology because heaven forbid I use technology for things that could be accomplished without it...then, I'm missing the point of maximizing tech with my students as a World Language Educator. There are so many AWESOME things that can be done with tech that should remain my focus (for example, Google Mystery Hangouts). Anyways, thanks for the great list! yes this site is really worth reading.